As well as being the main partner for the event, Everest will be the official partner for the Home, Garden & Pets stage. This is one of four themed areas at the show, where Everest will be joining celebrities from This Morning to host daily seminars giving hints and tips on security in the home. Everest's Marketing Director, Martin Troughton, said: "This Morning Live is an exciting new consumer show and a natural fit for Everest, as our homes are such an integral part of our lifestyles. The fundamental importance of feeling warm and safe in our homes is essential to our overall feeling of wellbeing, and only when we feel comfortable and secure can we really make the most of our homes and the world around us. "The Danish have a wonderful word called 'hygge', which has become a very popular concept here in the UK over the past year or so. The driving forces behind hygge are cosiness and contentment, but you cannot feel cosy or content if your home is not warm and safe. We'll be giving lots of tips to visitors at the show to help them improve their 'home hygge' and will also be unveiling an exclusive new addition to our windows that will take home security to a new level". 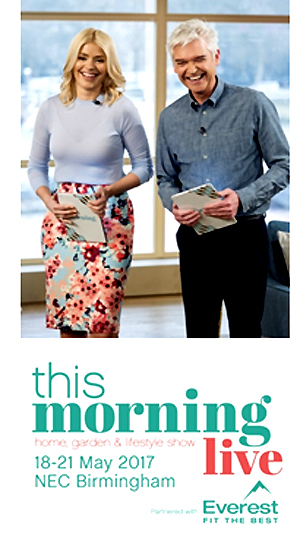 Katy Roberts, Event Director at This Morning Live, commented: "As the UK's most exciting consumer event for 2017, lifestyle lies at the heart of This Morning Live and will embrace all elements of the most-loved ITV daytime programme from home interiors to fashion and food, beauty and wellbeing. "Everest's values to be the best and deliver quality products fits perfectly with our vision and we are delighted to be working with them as our headline partner and sponsor of the Home, Garden & Pets stage. As a lifestyle event we want to help inspire our visitors with exciting products and big trends such as 'home hygge' helping to improve the feeling of contentment and happiness. "We look forward to welcoming the Everest team to the event and inspiring our visitors over the four days of the show".